Athletes in contact sports are at significant risk for traumatic injury to their teeth and mouth. 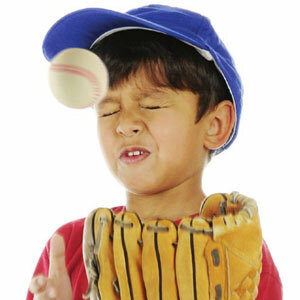 It’s estimated 600,000 emergency room visits each year involve a sports-related dental injury. 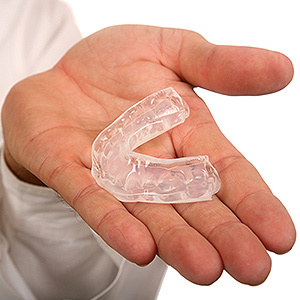 Athletic mouthguards have become the premier safeguard against sports-related oral injuries. First worn by professional boxers in the 1920s, mouthguards are now required for use by various sports associations and leagues — from amateur youth to professional — for a number of sports. The National Collegiate Athletic Association (NCAA), for example, requires their use during play for hockey, lacrosse, field hockey and football. The American Dental Association recommends mouthguards for 29 sports or exercise activities. But do mouthguards actually prevent injury? To answer that question in a scientific manner, the Journal of Sports Medicine published an evidence-based report in 2007 on mouthguard effectiveness for preventing or reducing the severity of oral-facial injuries and concussions. While the report objectively analyzed many of the problems and issues associated with mouthguards (like materials, design and durability), it concluded the risk of an oral-facial injury was nearly two times greater without the wearing of a mouthguard. That being said, most dentists and other professionals in sports safety would advise not all mouthguards are alike. The stock, “off the shelf” mouthguard found in many retail stores with limited size offerings is the least expensive, but also least protective, of mouthguard types. Mouth-formed or “boil-and-bite” protectors, which are softened in boiling water and then bit down on by the player to form the fit, are better than the stock version — however, they often don’t cover all of the player’s back teeth. The best option is a custom-designed guard made by a dentist for the individual patient. Although relatively expensive (costs range in the hundreds, compared with $25 or less for a stock guard), they provide the highest recognized level of mouth protection. The bottom line: a mouthguard is a must-wear part of any uniform for any sport that involves contact or high velocity objects of play. If you or a family member is a contact sport athlete, it’s essential you protect your teeth and mouth with a custom-fit, high quality mouthguard. As the Boy Scouts say, it's best to be prepared. You may never have a traumatic injury to your teeth. But what if you do? Here are four questions and answers about such injuries and their treatment that may be helpful some day. A traumatic injury can also cause broken, cracked, or split teeth, or a fracture to the root of the tooth. A tooth may be dislodged from its proper position, pushed sideways, out of or deeper into its socket. It may even be completely knocked out of your mouth. 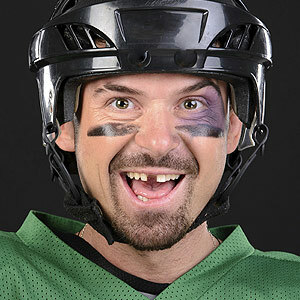 What should you do if your tooth is knocked out? With proper treatment, the tooth can be restored to its original place. You must handle the tooth gently and seek professional help as soon as possible. Rinse the tooth in cold water if it is dirty, but do not use any cleaning agent. Avoid touching the root. While hurrying to your dentist, keep the tooth from drying out by keeping it in a container of milk or of your saliva, or by holding it in your mouth between gum and cheek. It is vital to keep the tooth's living tissues moist until it can be professionally assessed and replanted in its socket. If a tooth has been dislodged but not knocked out, it must be repositioned in its socket and may be stabilized with a splint. Who can treat a tooth that is damaged by a traumatic injury? A general dentist, an oral surgeon or an endodontist is trained to treat such injuries. An endodontist is trained to treat the root canal(s) inside a tooth. The word comes from “endo” the Greek word for “inside,” and “odont,” the word for “tooth.” After a tooth is replaced in its socket and stabilized, root canal treatment is often needed. A tooth is composed mostly of dentin, a living tissue. The top part or crown is covered by hard mineralized enamel. The soft tissue inside the tooth, the pulp, contains blood vessels, nerves and connective tissues. It extends from the crown to the tip of the roots. Treatment of dental pulp injuries is called root canal or endodontic treatment and is usually needed to treat teeth that have been dislodged or fractured.